A modern tattoo is embedded approximately one millimeter beneath the skin. Tattoo removal aims at eradicating the pigment from the dermis layer with minimal scarring and damage to the surrounding tissue. The process is long and often costly with varied individual results. Laser technology has become the preferred method of tattoo removal and usually provides excellent results and minimal scarring. Lasers use short pulses of light to penetrate the epidermis and break up the tattoo pigment in the dermis layer of the skin. Once the ink has been reduced to smaller particles, the immune system then expels them from the body as foreign matter. The removal process requires several sessions spaced at intervals of four to 12 weeks apart and produces a gradual lightening of the image at each session. The entire process typically takes a minimum of 18 months to complete. As with any tattoo removal method, individual results may vary, and it may only be possible to achieve a partial removal of the image. A painful yet tolerable procedure, most patients report a sensation similar to that of being snapped with a rubber band. A local anesthetic can be used to make the client more comfortable during the process. The removal site will be red and inflamed after each session, with a soreness comparable to a moderate to severe sunburn. Small pinpoints of bleeding are not uncommon, and some blistering may occur. It is important to keep the site clean and avoid exposure to hot water and direct sunlight. Laws regarding who may perform laser removal vary by state. Certain states, such as California, permit only doctors, physician assistants, and registered nurses to conduct laser treatments. Other states allow non-medical personnel with the proper licensing to perform the procedure. The costs of an individual laser removal session varies by provider and the size of the tattoo. For instance, a doctor in Atlanta, Georgia charges $125 per session for tattoos the size of an apple or smaller, and $150 per session for tattoos the size of a grapefruit. However, a dermatologist in New York City may charge up to $200 per session for a tennis ball-sized image. The number of sessions required depends on just how difficult it is to remove the image. Dr. William Kirby and Dr. Alpesh Desai have developed a scale to determine the number of necessary sessions. The Kirby-Desai scale has become the accepted standard of measure used by medical professionals and certified technicians when estimating the cost of laser tattoo removal. Each variable is assigned a score ranging from one to five, depending on the degree of difficulty it adds to a successful removal. The more points assigned, the higher the number of sessions estimated for removal. A tattoo removal specialist will typically determine your Kirby-Desai score first and provide you with an estimated cost for removal. Laser removal is not the only option, but the other procedures are considered cosmetic surgery and must be performed by a doctor. Dermabrasion is the process of peeling away the top layers of skin with an abrasive rotary tool to sand the tattoo image from the skin. Performed by a dermatologist or cosmetic surgeon, dermabrasion can be a painful procedure and entails the use of local anesthesia and chilling of the site to ease the patient's suffering. 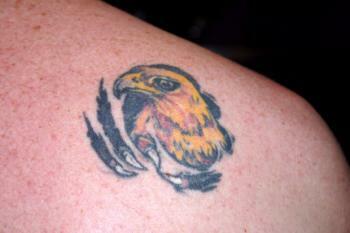 As with other types of tattoo removal, the image may still be slightly visible after treatment. According to the Mayo Clinic, affected areas will be sore and tender for up to 10 days following the procedure. Care should be taken to keep the area clean to decrease the chance of infection. Removing a tattoo using dermabrasion may result in permanent scarring. Excision is another method of removal performed by a doctor which involves cutting the tattoo from the skin and closing the incision with sutures. As stated in the Mayo Clinic article referenced above, surgical removal of a tattoo leaves no visible trace of the image, but it does result in scarring. Typically, only individuals with very small tattoos are considered candidates for excision since removing larger pieces using this method may necessitate skin grafts. The costs of dermabrasion and excision removal procedures vary depending on a variety of factors and can be comparable to, or exceed that, of laser removal. To get pricing, you you will first need to meet with the doctor for a consultation so he or she may assess the extent of the treatment required to remove the image. During the initial meeting, the doctor will assess such factors as the size and location of the area to be treated as well as its approximate depth under the skin's surface. Other factors such as geographical region and the experience of the physician also play a role in determining the cost. Size of the tattooed area: The larger the tattoo, the greater the chance of residual ink remaining visible. The types of ink used: Newer tattoo inks are longer lasting and harder to break down. Professional vs. amateur tattoo: Professional tattoos use more durable ink which is applied densely at a deeper, more uniform depth than most amateur tattoos. Age of the tattoo: Older tattoos can be easier to remove than newer ones since the pigment has already begun to naturally degrade. Scarring: The presence of scar tissue can make tattoo removal more difficult. Living with a tattoo of poor quality or one that no longer represents the image you wish to project to the world can be a source of embarrassment and harmful to your self-image. Fortunately, tattoo removal is a very real possibility, albeit one with physical and financial costs. The process is usually painful, and it is not typically covered by health insurance plans. Although there are social programs which offer free services for individuals who wish to remove gang-affiliated or prison tattoos, the majority of people will have to cover the full cost associated with removal. Before choosing the method of removal best suited to your needs, it is important to educate yourself about the advantages and risks associated with each technique. To achieve the best results possible, you should take care to choose a skilled provider who will instruct you in proper aftercare and provide support in the event of complications.